Prep Time: 25 Minutes. Inactive Prep Time: 1 Hour. Cook Time: 5 Minutes. 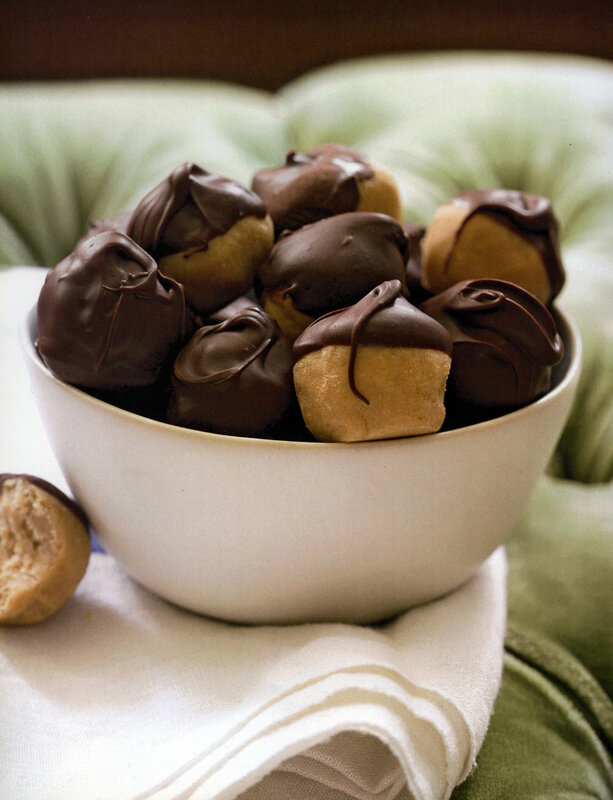 My great-aunt Pat makes these peanut butter balls and everyone goes crazy for them. Honestly, I can't sleep at night when they are in my house-I have to eat them. Luckily, they're sure not to last through the big game! In a medium saucepan over low heat, melt the butter with the peanut butter. Stir in the vanilla. Remove from the heat. Stir in the sugar until smooth. (The mixture will be the texture of thick dough.) While still warm, use your hands to shape the dough into balls by the tablespoonful. Place on the baking sheet. In a saucepan over medium-low heat, melt the chocolate, stirring constantly. Remove from the heat and use a toothpick to dip balls halfway in chocolate. Place back on the baking sheet. Refrigerate until set, about 1 hour.